As the living room started looking better and better, the kitchen started feeling worse and worse. My determination to ignore the kitchen was becoming more and more difficult everyday. The oak elephant in the corner seemed to be growing. 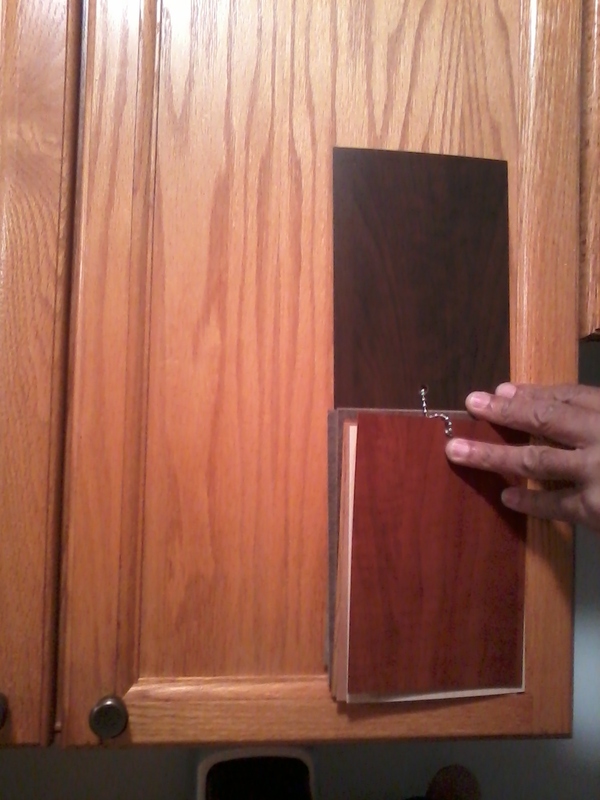 My original plan for the kitchen cabinets involved a Rustoleum cabinet refinishing kit. 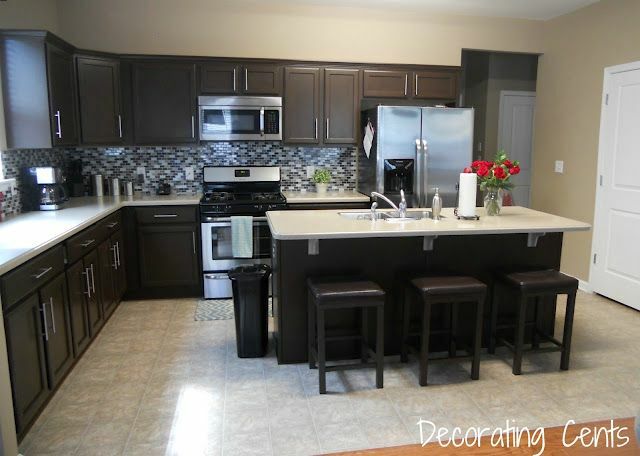 My husband and I thought that classy dark wooden cabinets would go best with our new dark floors, and we decided to purchase our kit with the Espresso Tint. On the box, this color looked perfect! But then, we started to live in our apartment and got to know the kitchen a little better. 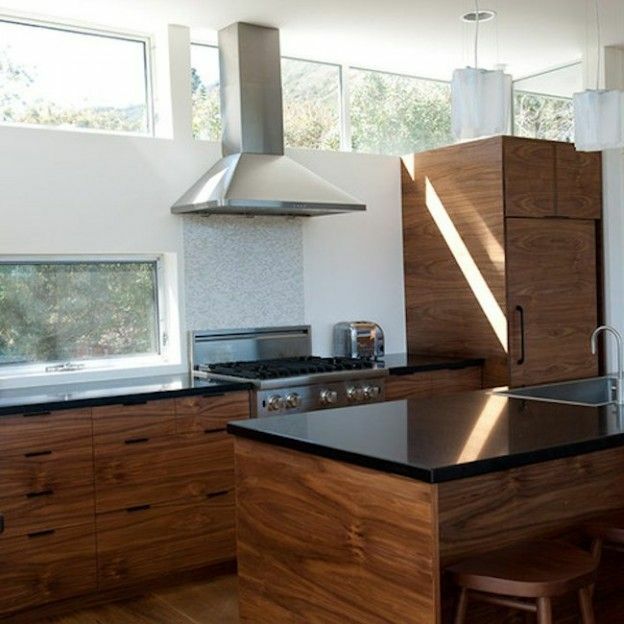 We quickly realized that our kitchen had very little natural light. 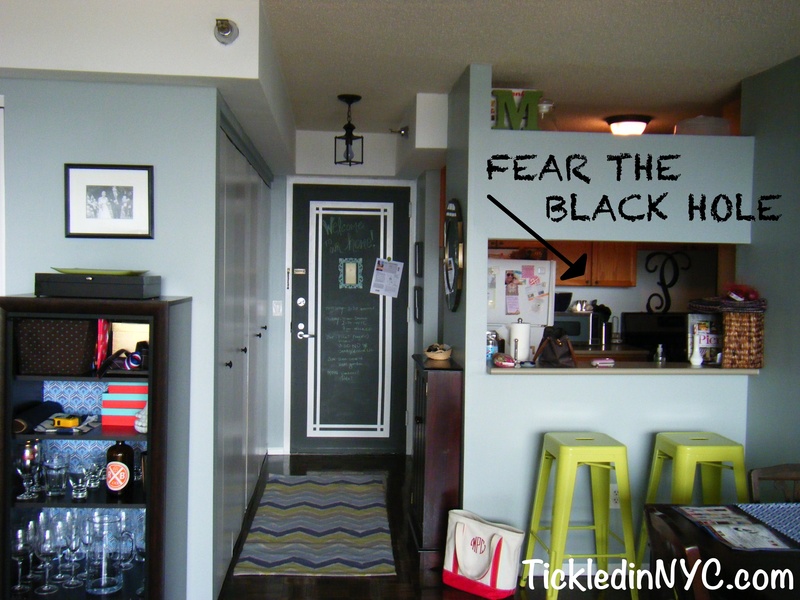 It had the very real potential to turn into a black hole in the corner of the living room. This insight certainly made me pause to consider if Espresso was really the right color for us. 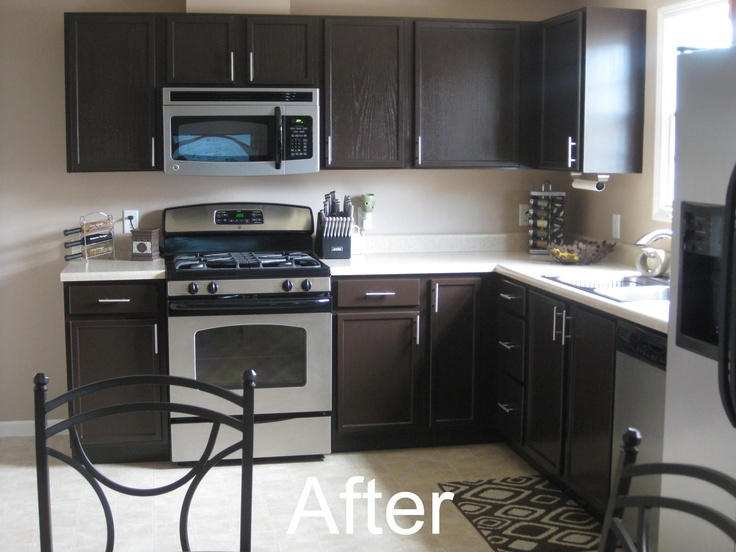 I went on Pinterest and Rustoleum’s Transformation Gallery to collect some photos of other Espresso kitchen results. After doing my internet research I felt more confused than ever. 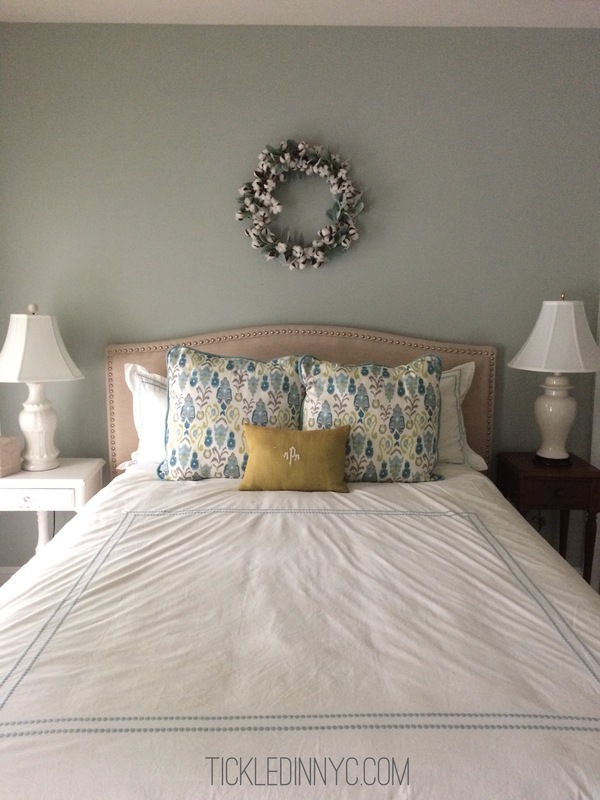 This espresso color looked different in almost every project! 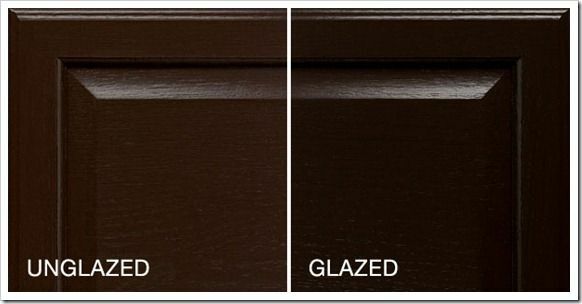 It looked entirely black in some rooms, and like simple unappealing brown paint in others! Most importantly, most of these photos shows an area with excellent natural lighting. Only the bathroom vanity photo felt like a realistic comparison to our kitchen lighting…and I wasn’t loving it. 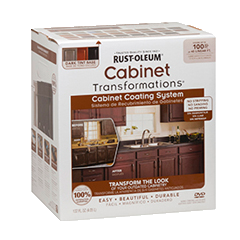 The Rustoleum Cabinet Kits include an optional glaze to create a wood grain contrast for your cabinets. It seems the glaze darkens the original color by at least a shade or two which left me in a pickle. 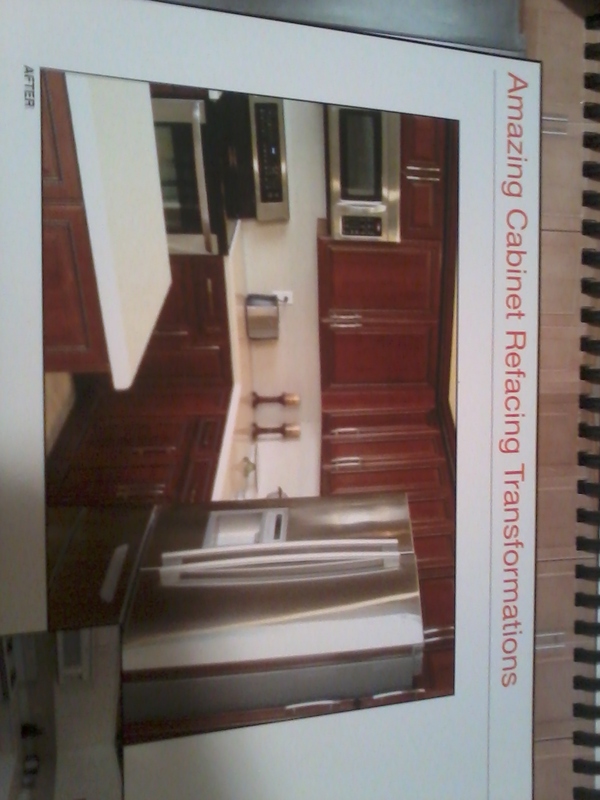 I already had solid wooden cabinets. I wanted to give them added richness by darkening their color, but I didn’t want to paint them an ugly brown, and if I added the glaze to improve their appearance they would become even darker and quite possibly create that unfortunate black hole I was so worried about. 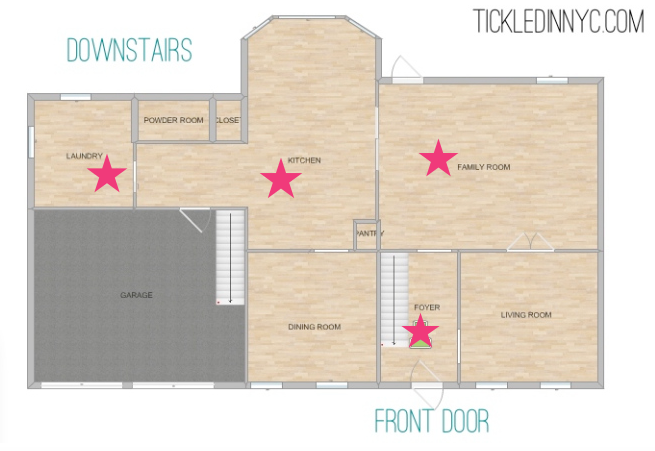 I’m not sure when we decided that we might be able to afford an entire kitchen refacing instead, but we ended up calling in a few contractors to take a look at our space. The first guy was a local cabinet-maker who had grandiose ideas for improving our space. He wanted to add under-cabinet lighting, create a custom box for our fridge, replace the cabinet above the fridge so we could install a full size fridge, and of course reface the cabinets. We spoke about wanting solid wood doors, and mentioned walnut coloring (where he went off about the beauty of walnut wood) and we realized we suddenly trapped ourselves into solid walnut cabinets (but they had to be flat panel without any detail – because he assured us that added details would be way too expensive). 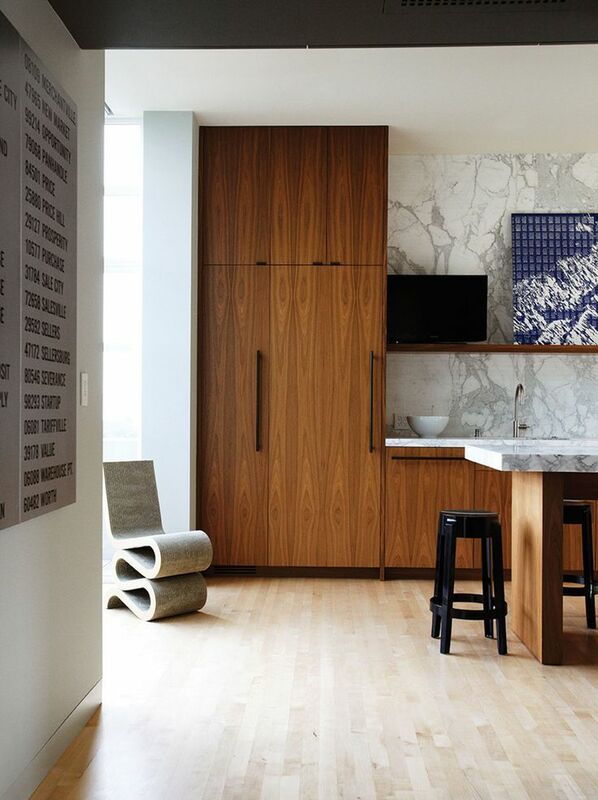 When he left I went online to search for what these flat panel walnut cabinets would look like. Need I go on? These were just NOT what I was looking for in a kitchen upgrade. The flat panel cabinets felt oddly out of date and yet had a overly modern IKEA vibe to them at the same time. 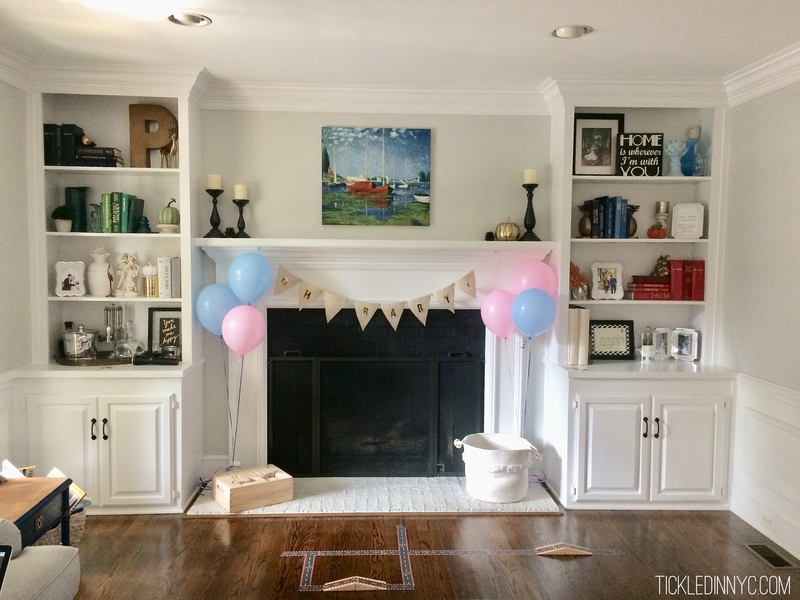 I was not feeling it – especially for the thousands of dollars needed to complete he project. 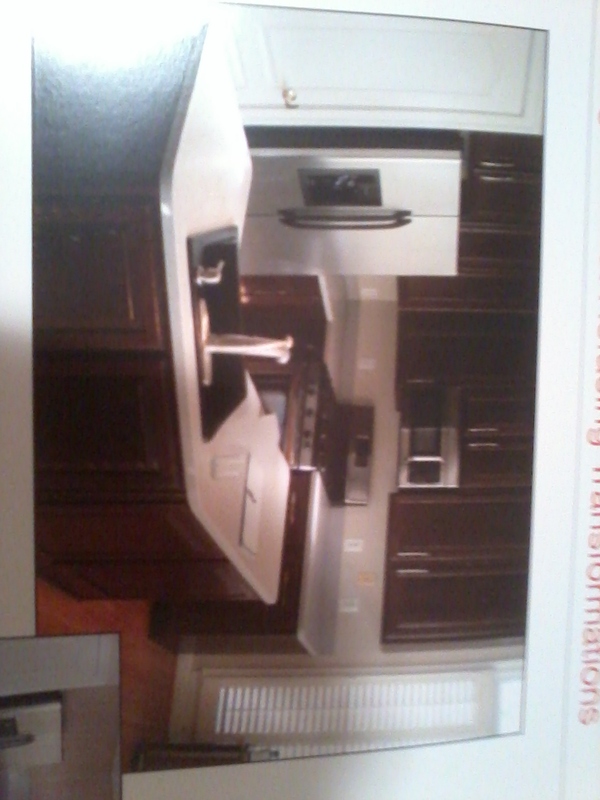 The second kitchen refacing expert we had in our home was from Home Depot. I had read good things online, and since the in-home consultation was free, my husband and I figured it was worth a shot. The gentleman who arrived at my apartment was a little upset that my husband wasn’t there. 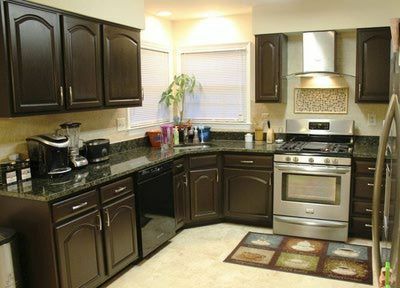 He had to work late unexpectedly, but apparently Home Depot won’t allow you to make a decision on your kitchen cabinet refacing unless both parties are in attendance at the time of selection. Who knew? He allowed me to take a few quick photos of his books to help me share the information with my hubby. (He was pretty grumpy about it). I was a little surprised that their color selection wasn’t more varied. We really only had 2 wood tones to choose between. I thought the darker color was best, but it was still a bit darker than I was hoping for. I liked the high quality look of the doors and their detailing, but when he brought one out for me to touch it wasn’t real wood! It was hollow and plastic. I was beginning to feel like this was the wrong choice. 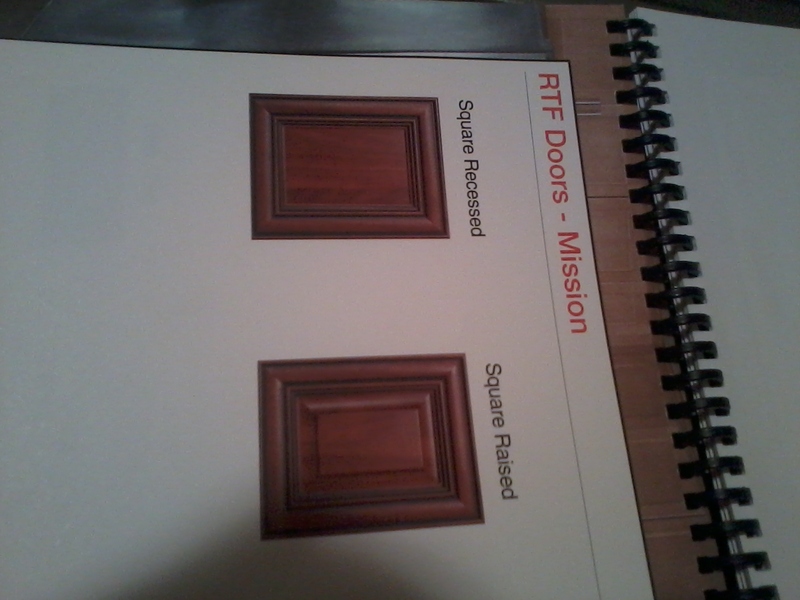 Why would I spend money to replace my solid oak doors with fake plastic feeling wood? 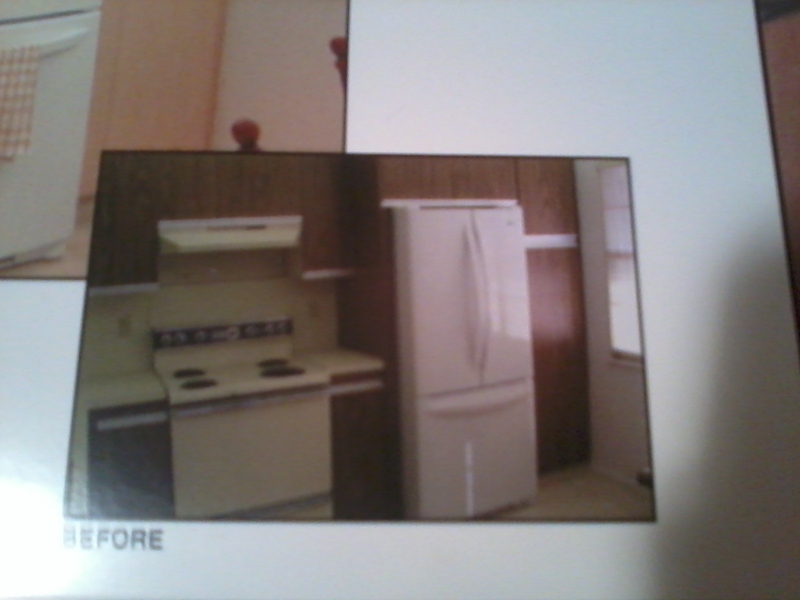 These are the quick photos I was allowed to take of his book for color reference with an entire kitchen in view. Please excuse the poor quality, these were taken in a rush. 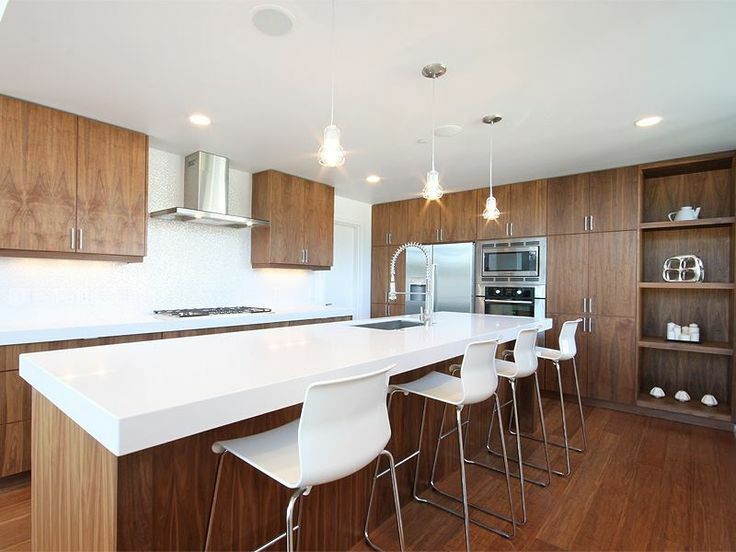 I snuck this last photo of a “before” kitchen because it looked alarmingly similar to the flat-panel walnut cabinets the other contractor had been pitching to us. Kinda funny, right? Before leaving, he carefully measured everything that would need to be covered and replaced, jotting it all down on a piece of paper that i thought was mine to keep. When I asked for the paper to show my husband, he said he had to take it with him. What?! I would have taken notes!!! 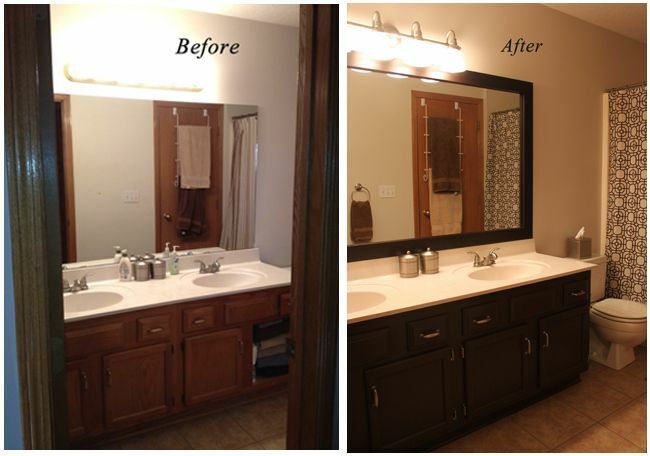 Removal of old cabinet doors, old countertop, sink, and faucet. I certainly hope there was something else, but since he took his piece of paper I can’t remember everything that the quote included! That was a devastating blow. Home Depot was supposed to be the most affordable option!! So much, for hoping that a big box retailer could offer a bigger discount because they buy in bulk! 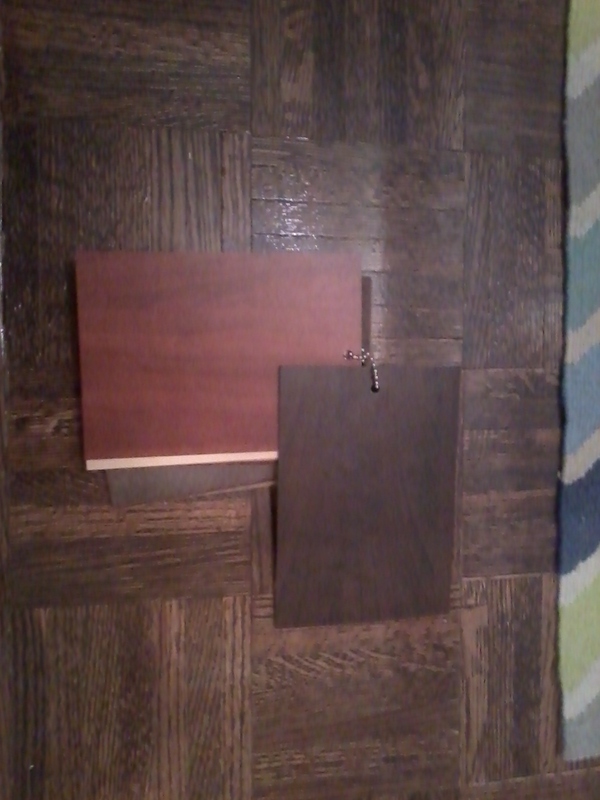 Since neither of those options was going to work out, I needed to regroup and figure out another plan for our kitchen. At the end of the day, I’m a Southern girl. Even though I was living in New York City, deep down I wanted a Southern Kitchen. 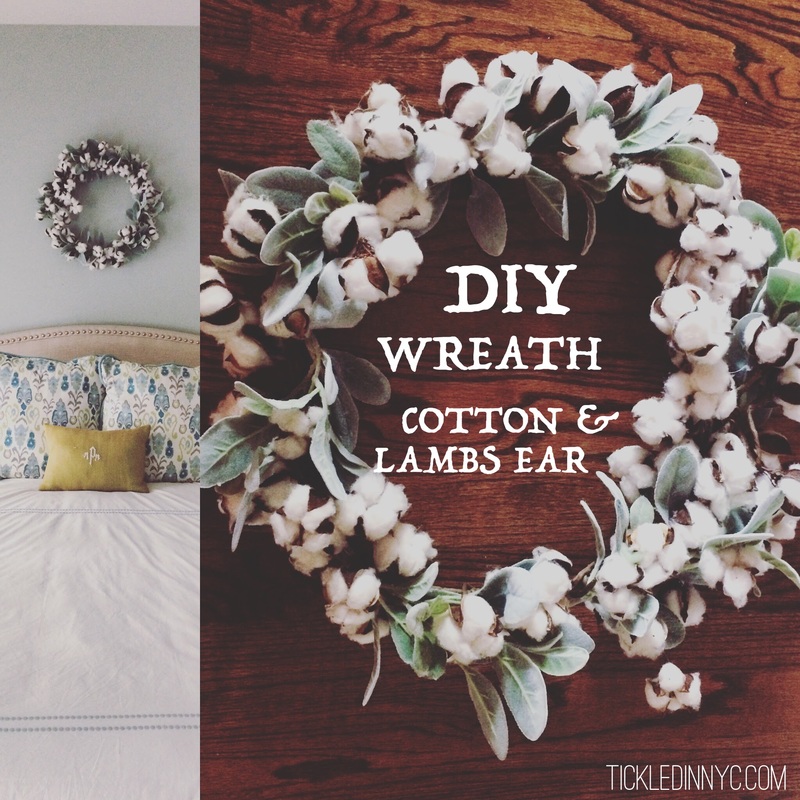 I wanted a beadboard backsplash, white cabinets, marble or butcher block countertops, and a farmhouse sink! 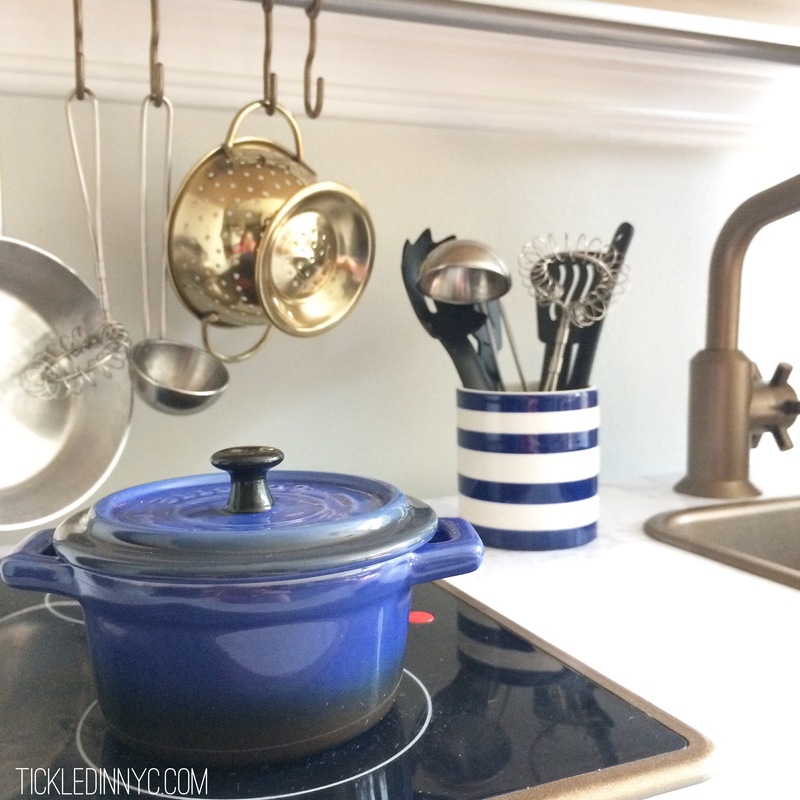 It was time to decide whether to update our kitchen for resale value and potential future buyers, or to update it for ourselves, in ways that we find the most pleasing to live with for as long as we are here.